The Community Action Commission (CAC) of Fayette County helped celebrate the new home of Charles Cadamy on Wednesday afternoon on Staunton-Sugar Grove Road in Fayette County. Pictured (L to R): front row: Vernon Stanforth, Fayette County Sheriff; Charles Cadamy; Joy Stanforth; Joan Simmons, loan specialist with USDA Rural Development; and Godwin Apaliyah, director of Fayette County Economic Development. Back row: Dan Dean, Fayette County Commissioner; Joe Denen, Washington Court House City Manager; Steve Creed, CAC Self-Help Housing director; Jack DeWeese, Fayette County Commissioner; Tony Anderson, Fayette County Commissioner; Bob Peterson, State Senator (R-Washington Court House); Bambi Baughn, executive director of CAC; David Hall, USDA Rural Development State Director; Julie Bolender, president of the Fayette County Chamber of Commerce; and Trevor Patton, Washington Court House City Schools director of marketing and communications. 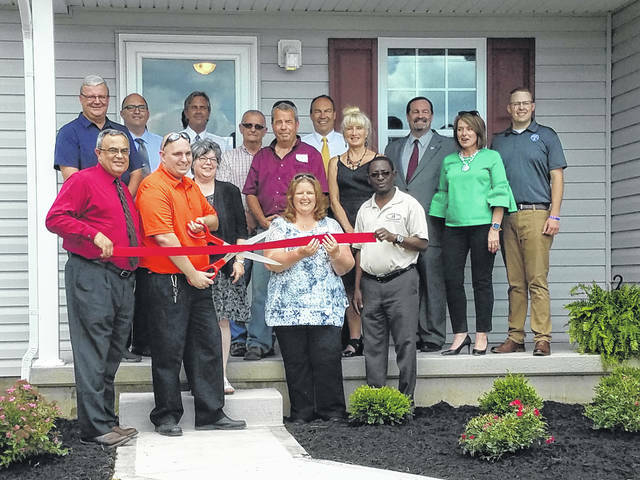 The Community Action Commission (CAC) of Fayette County joined together with local and state officials to celebrate a new homeowner on Staunton-Sugar Grove Road Wednesday afternoon, thanks to the Self-Help Housing Program. Charles Cadamy, who was featured in a June 17, 2015 article in the Record-Herald as part of the Fayette Progressive Industries Employment First initiative, is the most recent homeowner to join a long line of participants in the CAC Self-Help Housing Program. Thanks to his own volunteer work in helping to construct the home and his efforts to be financially secure thanks to assistance from CAC, he was able to cut the ribbon on his house Wednesday afternoon with a crowd of supporters watching. Cadamy has worked for over five years at Stage Stores Distribution in Jeffersonville, was a part of the Fayette County Dragons basketball team that won a state title this year, and said he is engaged and plans to marry next year. So all-in-all, he said he is excited and happy with life. During an interview Wednesday, he thanked the Stanforths, the Fayette County Board of Developmental Disabilities, the CAC and Frontier Community Services. The Self-Help Housing Program serves those who make 80 percent or less than the area median incomes of the various counties that are served. The mortgages for the homes are obtained through the USDA Rural Development, and are a low interest rate loan with no downpayment required to become a homeowner. According to Steve Creed, CAC Self-Help Housing director in Fayette County, this program is a benefit to families in many ways. Families that participate in the program have immediate financial equity in their homes due to the fact that costs for labor are greatly reduced thanks to the contribution of their own labor in the build or rehab of a home. It has been proven through various studies that children do better both emotionally and educationally as well, according to Creed. Children growing up in stable housing helps raise educational achievement and with better education, a better chance for higher earning as they become adults. Their emotional well-being is helped due to the stability of not having to worry about where they’re going to live, getting out of substandard rentals and poor neighborhoods, and by the example their parents set by working to provide that stability, according to Creed. “Charles Cadamy has done a great job in our program,” Creed said. “With help from his support system of Vernon and Joy Stanforth and the help of Fayette Progressive and others, he has developed into a great young man who is beginning to take care of his future and the responsibilities that come with it. Charles put a lot of effort into the sweat equity portion of his home and now has a beautiful home that he is very proud of. One of the things we are proud of with the Self Help program I spoke of at the event is the fact that we have helped individuals and families in our community secure almost $23 million in mortgages to enable and fulfill their dreams of owning their own home. Of the $4.735 million in grants we have secured for the program, it has all been spent locally. We purchase from local vendors, pay local contractors, pay salaries to staff, all of which continues to be spent locally. With our program we also contribute money back into the community by improving homes that exist in neighborhoods that would otherwise deteriorate and drag down the values of the other homes in the neighborhood. By improving the existing homes’ worth and building new homes, we have added more money to the local tax base, enabling the city and county to have more funding for things like fire, police, street repair, etc. According to Creed, he also said that this program assists the economics of the community by increasing the tax base of the community, allowing for more services for the citizens of the community. By restoring existing homes in the neighborhoods, it not only increases the value of the home being rehabbed, but also increases the attractiveness of the neighborhood by raising home values for the neighbors and eliminating blights and eyesores. For more information about the program, contact the Self-Help Housing department at (740) 335-1831.
https://www.recordherald.com/wp-content/uploads/sites/27/2018/06/web1_20180620_140813.jpgThe Community Action Commission (CAC) of Fayette County helped celebrate the new home of Charles Cadamy on Wednesday afternoon on Staunton-Sugar Grove Road in Fayette County. Pictured (L to R): front row: Vernon Stanforth, Fayette County Sheriff; Charles Cadamy; Joy Stanforth; Joan Simmons, loan specialist with USDA Rural Development; and Godwin Apaliyah, director of Fayette County Economic Development. Back row: Dan Dean, Fayette County Commissioner; Joe Denen, Washington Court House City Manager; Steve Creed, CAC Self-Help Housing director; Jack DeWeese, Fayette County Commissioner; Tony Anderson, Fayette County Commissioner; Bob Peterson, State Senator (R-Washington Court House); Bambi Baughn, executive director of CAC; David Hall, USDA Rural Development State Director; Julie Bolender, president of the Fayette County Chamber of Commerce; and Trevor Patton, Washington Court House City Schools director of marketing and communications.